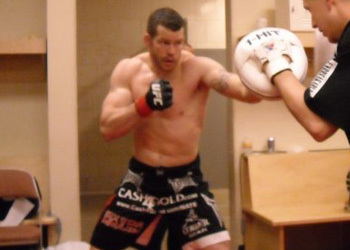 Just minutes before Nate Marquardt was scheduled to officially weigh-in for his welterweight debut, the former 185-pounder abruptly pulled out of tomorrow night’s “UFC on Versus 4” fight with Rick Story. The heavyweight shootout between Cheick Kongo and Pat Barry, which was originally slated for the co-main event, has been promoted to the card’s main attraction. Story will now face Charlie Brenneman in a featured bout. According to reports, Marquardt did not receive medical clearance to fight. Prior to Saturday’s weigh-ins, UFC color commentator Joe Rogan announced Marquardt was pulled because he failed his physical. “UFC on Versus 4” takes place Sunday inside the Consol Energy Center in Pittsburgh, Pennsylvania. Versus will broadcast the main card live beginning at 9PM ET/6PM PT.